Child Rights in Eaglesham LI: To explore the rights to which others and I are entitled. 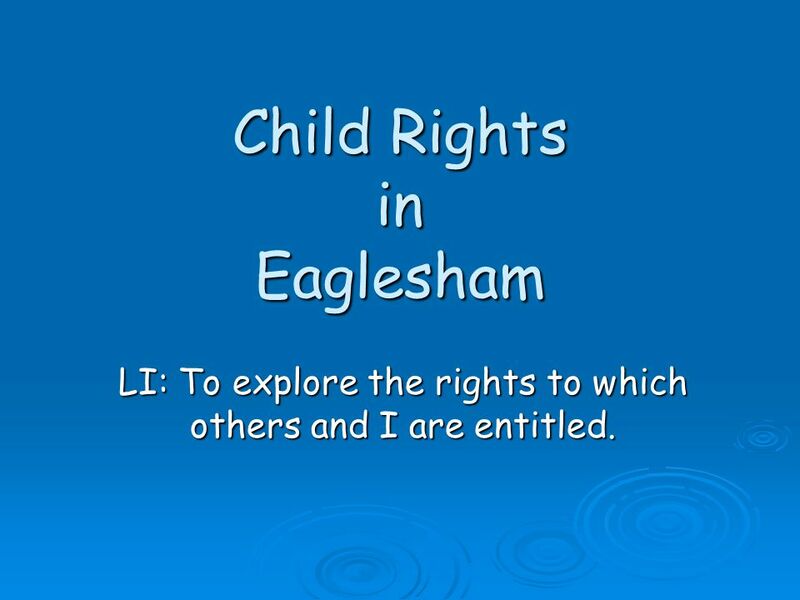 1 Child Rights in Eaglesham LI: To explore the rights to which others and I are entitled. 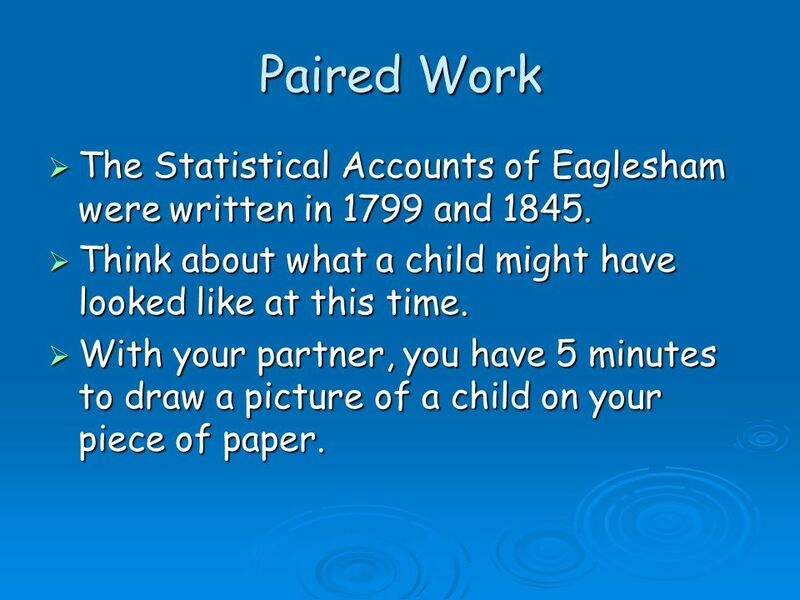 2 Paired Work  The Statistical Accounts of Eaglesham were written in 1799 and 1845.  Think about what a child might have looked like at this time.  With your partner, you have 5 minutes to draw a picture of a child on your piece of paper. 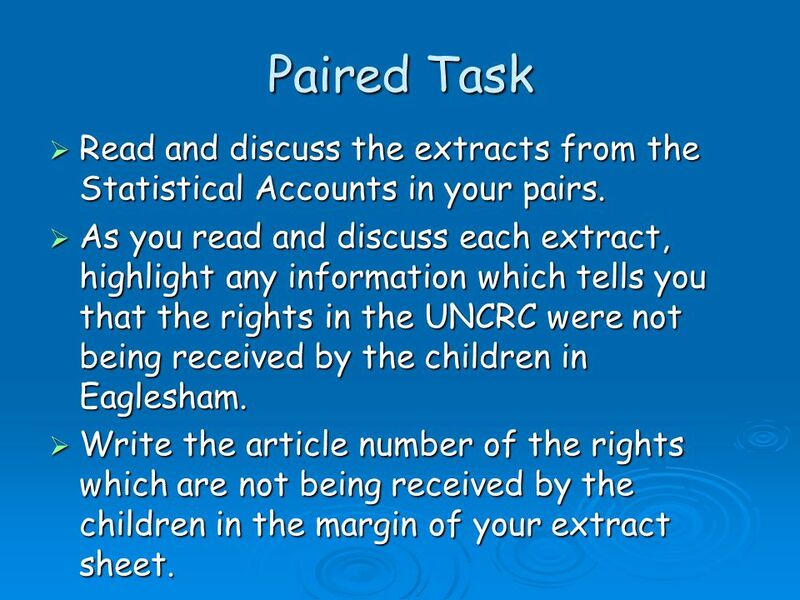 3 Paired Task  Read and discuss the extracts from the Statistical Accounts in your pairs.  As you read and discuss each extract, highlight any information which tells you that the rights in the UNCRC were not being received by the children in Eaglesham.  Write the article number of the rights which are not being received by the children in the margin of your extract sheet. 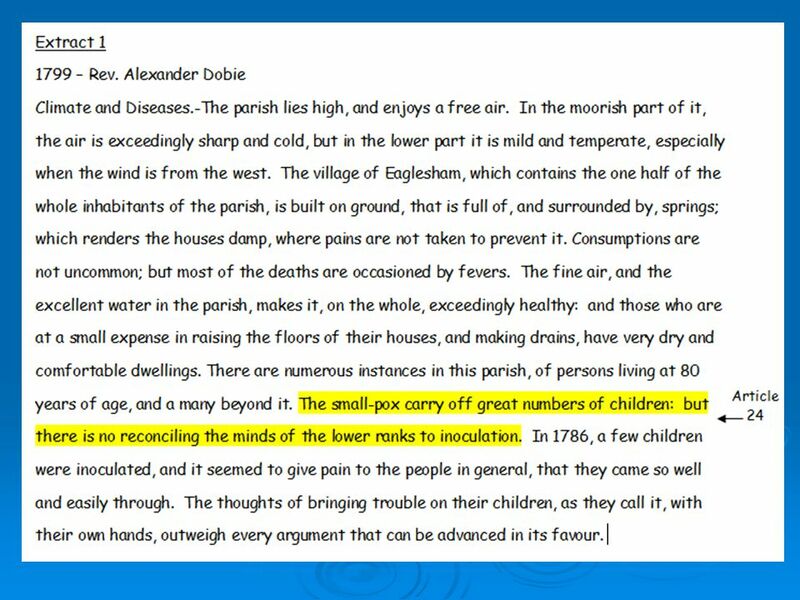 5  The small-pox carry off great numbers of children: but there is no reconciling the minds of the lower ranks to inoculation. 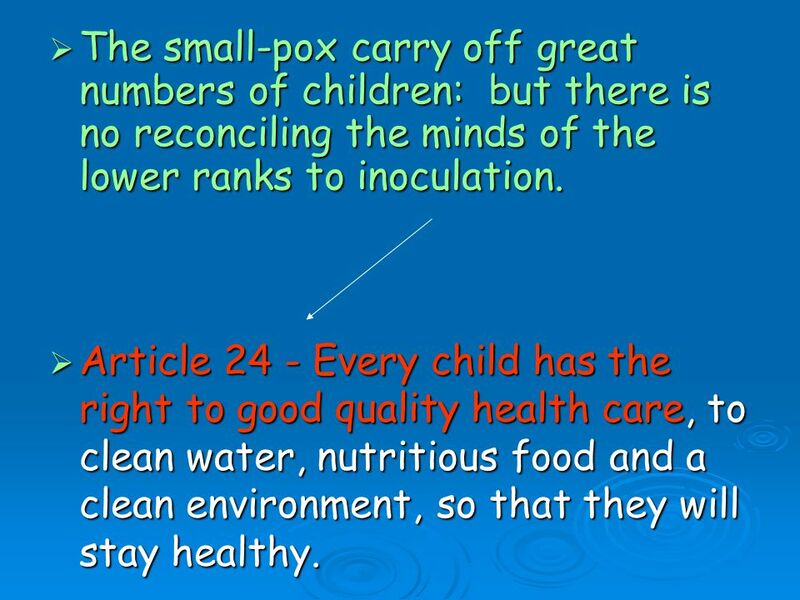  Article 24 - Every child has the right to good quality health care, to clean water, nutritious food and a clean environment, so that they will stay healthy. 7 Article 24 - Every child has the right to good quality health care Article 28 - Every child has the right to an education. Primary education must be free. Article 32 – Governments must protect children from work that is dangerous or might harm their education. Article 27 – Every child has the right to a standard of living that is good. 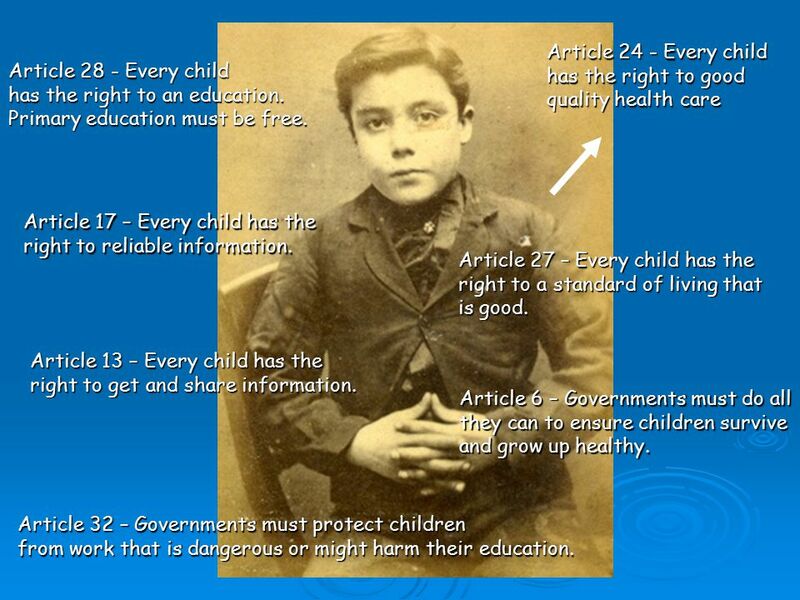 Article 17 – Every child has the right to reliable information. Article 13 – Every child has the right to get and share information. Article 6 – Governments must do all they can to ensure children survive and grow up healthy. 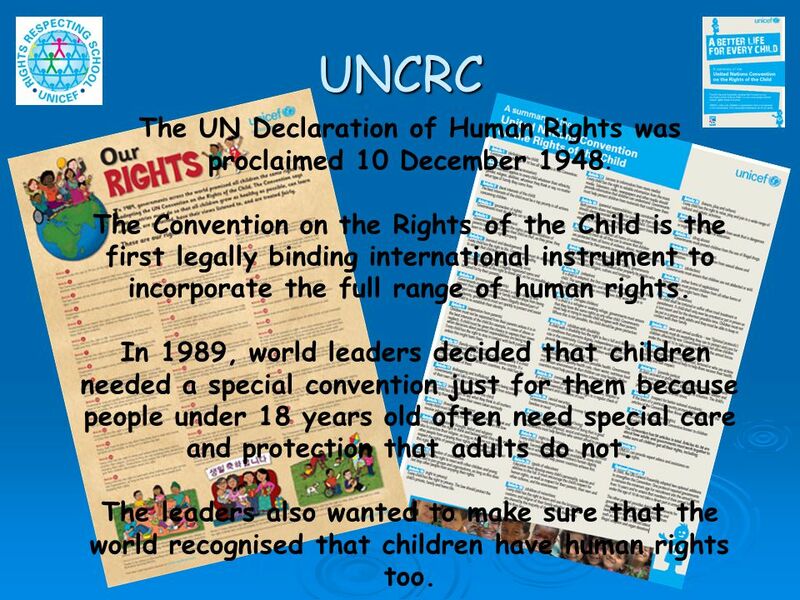 8 UNCRC The UN Declaration of Human Rights was proclaimed 10 December 1948. The Convention on the Rights of the Child is the first legally binding international instrument to incorporate the full range of human rights. In 1989, world leaders decided that children needed a special convention just for them because people under 18 years old often need special care and protection that adults do not. The leaders also wanted to make sure that the world recognised that children have human rights too. 9 Campaigning for Child Rights  Can you think of different ways that someone could campaign to establish Child Rights? 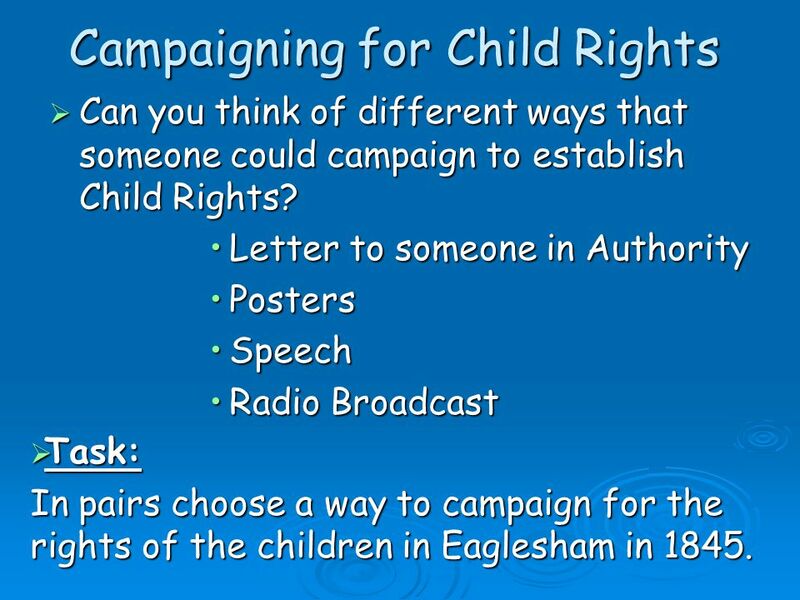 Letter to someone in AuthorityLetter to someone in Authority PostersPosters SpeechSpeech Radio BroadcastRadio Broadcast  Task: In pairs choose a way to campaign for the rights of the children in Eaglesham in 1845. Download ppt "Child Rights in Eaglesham LI: To explore the rights to which others and I are entitled." St. Marys - a Rights Respecting School United Nations United Nations Childrens International Emergency Fund – UNICEF United Nations Convention for the. 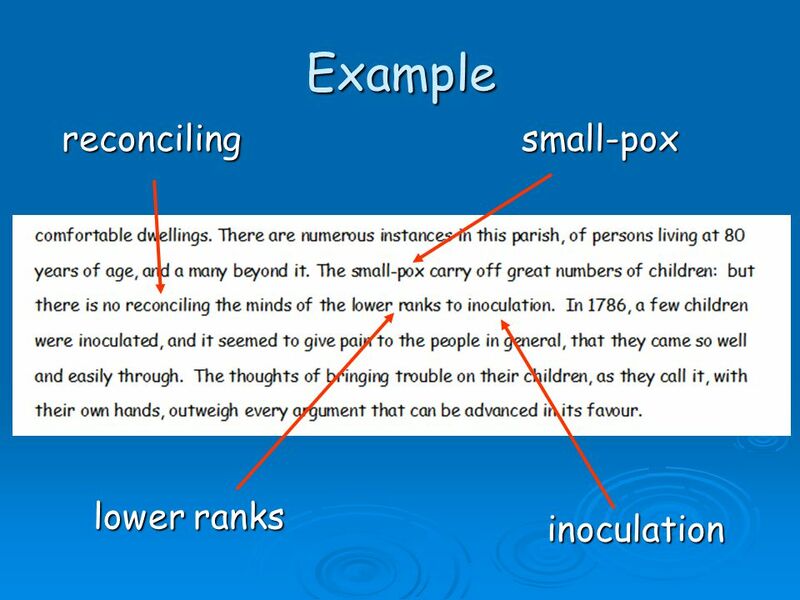 To highlight the importance of speaking and listening in maths lessons To consider ways of developing childrens mathematical vocabulary To look at a range. SADC Course in Statistics Introduction to the module and the sessions Module I4, Sessions 1 and 2. Law Access to Health Care as a Human Rights Issue Professor Fons Coomans Maastricht University Centre for Human Rights. © The Scout Association Cambridgeshire Module 8 Page: 1 of 19 Module 08 The skills of leadership Session 1 Planning and Leadership. Assessment for Learning in Primary Science Potter’s Bar Project Planning Day 2 Jane Turner, Heather Gilbertson Tuesday 9 th February. In 1989, governments worldwide promised all children the same rights by adopting the UN Convention on the Rights of the Child (CRC). The Governments of the world decided that certain rules apply to ALL children under the age of 18 to help keep them safe and protect their needs. What rights are children across the world entitled to? West Coats Primary School RRSA Launch Monday 18 th March 2013.